Ollie was a long bodied 2 year old when we had to move him out of his three-point securing car seat because his head was higher than the head restraint and he was too big to do up the seat belt. 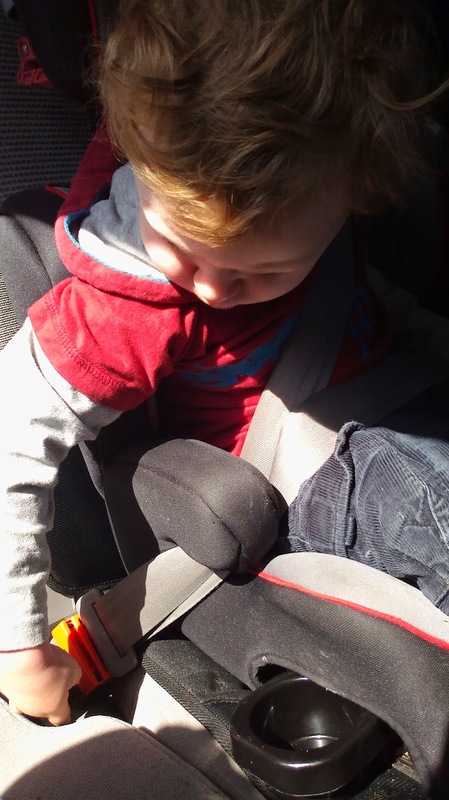 He went into the next age up car seat, with the regular car seat belt over his shoulder and lap. We then had several months of very stressful driving as he constantly undid the seat belt so we had to keep telling him off, pulling over, clicking him back in and carrying on. We tried distracting him with toys, wrapping a scarf around the buckle to hide it (I DO NOT recommend this or endorse it in any way as you may not be able to release it in an emergency, but we were getting desperate and trying things recommended by other parents we talked to). The salesman at the well known baby store we went to said there was nothing on the market to help and recommended "tough love"! It was Ok if there were two adults in the car and one of us was able to ride in the back with him, but that wasn't possible all of the time. Eventually his language skills developed enough that we managed to scare him with tales of how he would 'fly out of the car' if his seat belt was off. This worked well enough that now he yells at any adult driver who is slow to put their own belt on that they will fly out of the car and must put their belt on straight away (one of his many helpful backseat driver orders). Talking to other parents - interestingly, mostly the parents of boys - this seems to be a worryingly common problem. The danger of an unsecured child in the car is added to by the distraction to the driver and the added risks from having to pull over and then re-join busy traffic. Evidently, one parent going through this had the brainwave to actually design something to prevent the problem, and the BeltLock was born. I wish this had been stocked in that baby store when we visited it, but thankfully there is now a solution that works. It is a relatively inexpensive solution too, retailing for around £10 (it's an Irish company, so the online price is given as 12.50 in Euros). 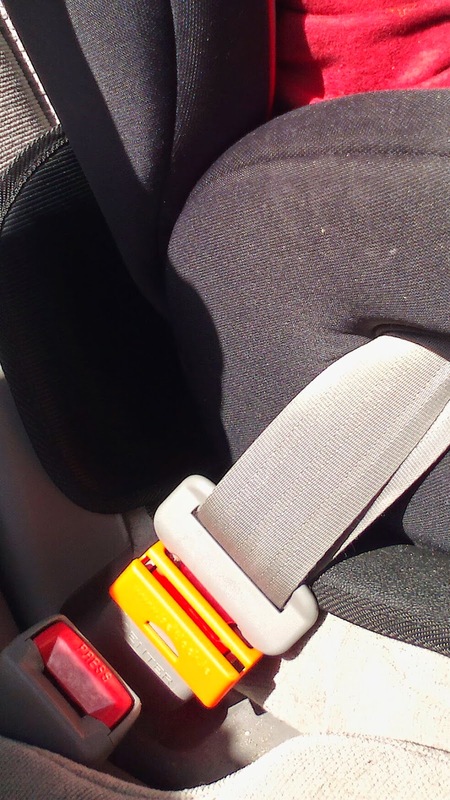 The device is a small orange plastic clip that sits over the seat belt receptacle. It doesn't interfere or change the functioning of any part of the belt, it simply prevents small fingers pushing the button. 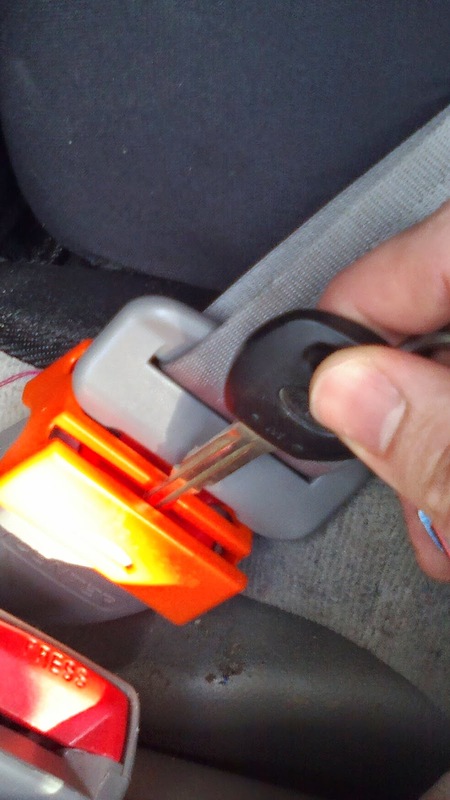 To release you poke a key, or any other narrow flat object, through the slot to depress the seat belt button. I was really cautious of any device that could make the belt less safe, but both Matt and I had a good play with it and can't foresee any problems - if, God forbid, there was an accident bad enough that the driver was incapacitated too badly to release the belt with their house key for example, I think that emergency services would be using belt cutters anyway. I feel wary of recommending safety equipment because it is a minefield of responsibility and what ifs, but I can only say that we liked it, and if you are interested it's worth popping over to the website and using your own judgement. The product is primarily designed with little ones in mind, but is also a useful addition for anyone driving a passenger with reduced responsibility such as a family member with reduced mental age who is known to play with their seat belt. Toby at 2 years old is not such a huge fiddler as his big brother was, but every so often he does go through a day of trying to extract himself from his seat. I can see this being especially useful for cars where an older sibling sits next to a younger one as Ollie has in the past unclicked the seat belt holding Toby's big Britax baby seat in place - thankfully by accident, before we drove off anywhere, and he owned up immediately so we could fix it. Since we received this product I'm certainly enjoying one less thing to worry about when we're driving. We received our BeltLock to try for free to review, but the opinions and photos are all my own (I'm hoping you can't see the marmite smeared next to the seat belt receptacle in the second picture). Please refer to the product instructions on the website for safe and appropriate use of the item.